Invacare microAIR® Alternating Pressure System is alternating pressure therapeutics support system that improves air circulation and features on-demand low air loss mattress which reduces interface pressure to aid in the prevention and the treatment of Stage I to Stage IV pressure ulcers with a state of the art 50 LPM compressor that inflates the mattress within five to 10 minutes and provides faster, more efficient and complete therapy cycles. Therapeutic Support Surface model improves air circulation and cools the body temperature with a unique system of air released into the mattress. 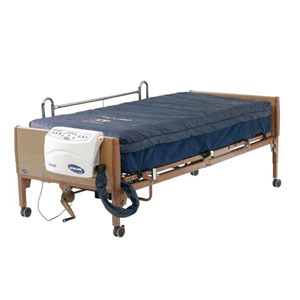 The MA65 mattress is an alternating pressure with on demand low air loss mattress replacement system that aids in the prevention and treatment of stage I to IV pressure ulcers. 1 year on mattress, 2 years on compressor warranty. Energy saving 50 LPM compressor has alarm, alarm silence, and lock out features as well as static mode. Pressure is continuously monitored to maintain proper pressure redistribution based on patient weight. Quilted 70 denier nylon quilted cover, nylon buckle straps, and built in carrying straps. Treatment times are 5, 10, 15, 20 minute cycles. Efficient real-time monitoring for correct pressure relief. Power outage safety withmattress hose is connected to the compressor. Visco-Top Bed Mattress 76" x 35" x 6"